Hostas are an extremely popular choice for shaded or damp gardens – and it’s no surprise, given their variety and tendency to sprout year after year. Check out our selection of foliage colors to find bright greens, yellow, and more for your garden. Most Popular Colors: Green, white, yellow, or blue foliage with white leaves. Climate Preferences: Winter-hardy in most temperate climates, but cannot tolerate winters with far below-freezing temperatures. Humidity is ideal, especially during the growing season. Sun Exposure: Shade or filtered light. Hostas grow best in morning sun and afternoon shade. Generally, blue-leaved hostas require shadier conditions than gold- and white-leaved varieties. 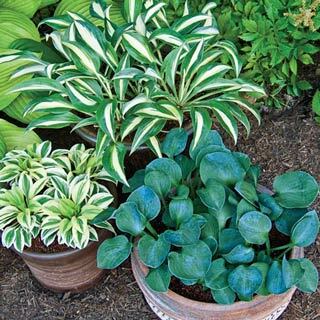 Landscaping Tips: Many varieties of hostas grow in strong, upright clumps. Plant them near shorter shade plants for lots of interest in your shade garden. Planting: All hostas prefer organic-rich soil, so add loam to the soil before planting. Soak the roots of the plant for about 30 minutes prior to planting. • Water deeply only when the weather is dry. • Remove spent flower stems to tidy up hostas – the foliage will continue to delight well past the blooming season.